Business owners often wait until their business is on the decline, before they seek the services of a business broker...this doesn't have to be the case! Owners will benefit from their knowledge and experience, by speaking to them before the decision to sell is made. In every business lifecycle, there comes a time when the owner should sell; Sometimes it’s a result of a strategic plan, other times it’s due to limitations. what you will need to prepare. Tips on how to identify that it might be time to consider selling your business, and when the best time to sell may be. SPEAK TO A BROKER: No obligation, no cost...just ideas! Organise a 15 minute chat with your local broker today, to talk about your situation. 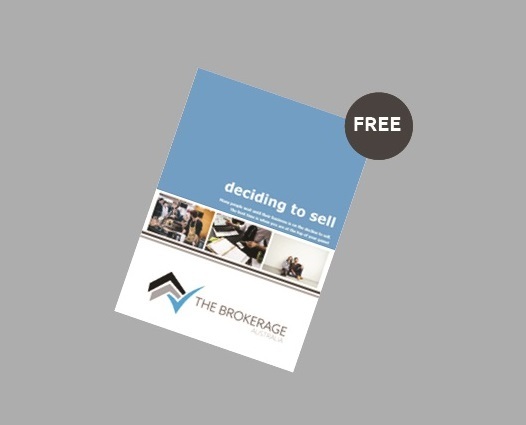 The Brokerage Australia, is a new and dynamic broking franchise. A one-stop-shop, offering business broking and mortgage/finance broking services. If you are looking to buy a business, or sell a business our team of professionals can broker a great deal for you!